Nihon Superior Co., Ltd., a supplier of advanced soldering and brazing materials to the global market, announces that it was awarded a 2013 NPI Award in the category of Soldering Materials for its SN100C P604 D4 Lead-free and Completely Halogen-Free Solder Paste. The award was presented to the company during a Tuesday, February 19, 2013 ceremony that took place at the San Diego Convention Center in California. 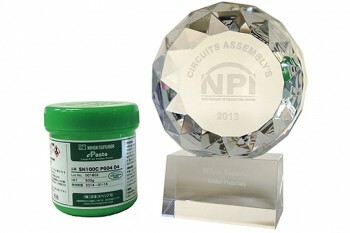 The NPI Award marks the second award the company has received for its SN100C P604 Solder Paste. In the development of SN100C P604 Nihon Superior found a way of formulating a solder paste that complies with the requirement of the EU RoHS Directive and does not use any chemicals requiring special registration under the EU REACH legislation without compromising on performance or reliability. This ambitious goal was achieved by choosing a series of non-halogenated activators that are effective at each stage of the thermal profile commonly used with halogenated solder pastes. Premiering in 2008, the NPI Awards program is an annual celebration of product excellence in electronics surface mount assembly. Premier products based on the finest examples of creative advancement in technology are chosen by a distinguished panel of industry experts.